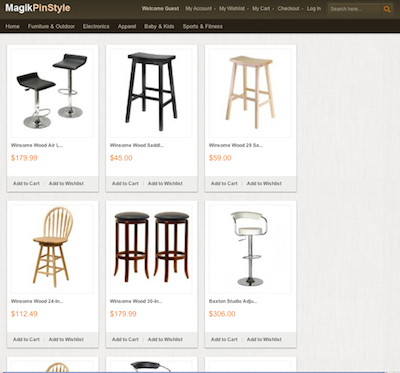 In my last video tutorial I showed you how to install a theme in Magento version 1.7.0.2. As I’ve stated in the video, the installation procedure is pretty much the same for older versions. Now that version 1.8.x.x has been released, the procedure still remains the same. Therefore, if you’d like to install one of the themes below which is compatible with older or newer versions of Magento, the video can still help and can be viewed here. If you’d prefer to have someone install the theme for you, know that installation services are usually offered for a fee on most of the sites listed below. This list features both free and premium (paid) themes. I actually spent quite a bit of time scouring the web for both so I can say without a doubt that I am impressed with all of them — and to be honest, the free themes really surprise me since it’s amazing that designers are willing to give away so much for free these days. At the same time, the premium themes do offer a lot of features and custom options that really justify why they cost money. Of course whether you choose free or premium, is solely up to you and your budget. Either way, I am pretty sure that you will be happy with either. While I don’t have demos available for the free ones here, most of the sites of these themes do offer demos. Of course for your convenience, I have added screenshots and a brief description of each theme so that you can get a better idea — hope you enjoy! If you’ve watched my video, you’ve already seen the theme that I installed in the video. If you haven’t, it was this one — a free theme by the name of BlueScale2103. 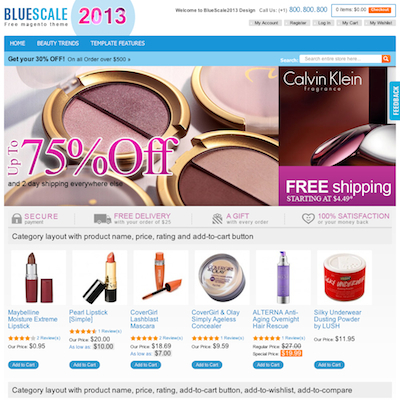 On the site, you will also see another BlueScale theme which I assume was designed prior to this one. None the less, both look pretty awesome. The one I installed seems to be geared towards stores that sell makeup and the other BlueScale seems to be geared towards stores that sell handbags and accessories. This particular theme has quite a few features and looks really nice so it’s surprising that it’s being offered for free. For example, it offers 5 backgrounds (choice of blue, grey, white, flowers and neutral), is partially responsive which means that it can adjust to screens that are between 990px to 1200px (while not mobile compatible, still impressive) and has other features as well. Here is a theme that can make you look like you’ve got that “it” that everyone is looking for. How you ask? Well with this awesome eBay theme! Which luckily is of the newer eBay that doesn’t use yellow throughout the site. I say this because I am hoping that it won’t really make you look like you are copying them — at least not too much. OK, well to be sure, I’d slightly modify the theme by changing the logo and removing that multi-colored line in the header section that just screams eBay — the rest I guess I’d leave alone because the look is pretty cool and trend setting to some degree. 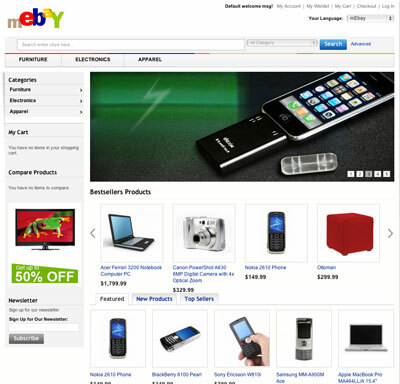 Of course how can you have an eBay look alike theme and no Amazon look alike, right? 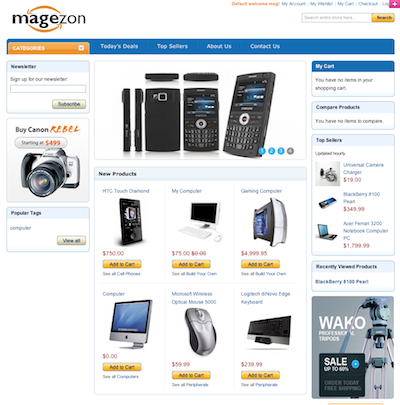 Well I agree and it seems like the people at MageWorld agree as well… So here we have mMagezon — a theme that resembles the way Amazon used to look. Well, I actually should rephrase all this… Here is a theme that reminds me of Amazon. I mean who’s to say that the designers intentionally replicated Amazon’s look or that they were at all inspired by the look of Amazon? Crazy me. OK. I promise this is the last look alike theme that I list (well at least in this article) but I have to add this one because the developers have it listed as “hot” which I suppose means that a lot of people found it to be cool. Which is why I can’t really skip this one. So here is mApple which resembles Microsoft’s err I mean Apple’s store. 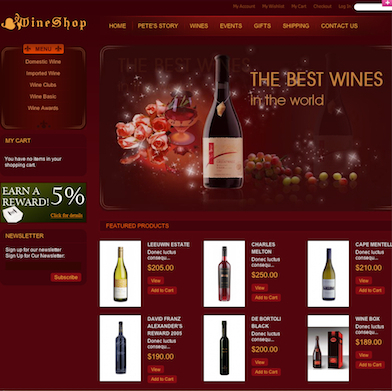 OK. Now that we are laying off the look alike themes, the first thing that happened to catch my eye was this wine theme… It looks awesome in red and will turn any plain looking wine and spirits or liquor store into a professional looking one in no time. Here you have a theme that can brighten anyone’s day. The flower shop theme let’s you choose between two colors — green or black with orange. 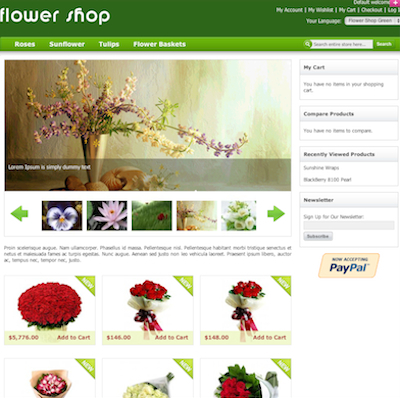 So if you sell flowers, this theme can turn a typical Magento store into a professional looking flower shop in no time — and for free. Choosing between all the beautiful themes that are available is a bit difficult for me because I really feel like a kid in a candy store. When looking at all of the themes that are available, I honestly have a hard time deciding between which ones to list and which ones to omit. Therefore, I have decided to add some variety here and try to list something for everyone. So here is a theme for those of you that sell kids clothing, toys or other children’s things. Every once in a while a new king is born on the internet. Recently, that new king was Pinterest and like many other kings have in the past, Pinterest has managed to influence others — and when I say influence, I mean sites started to look and act like them. For example, eBay adapted the look and feel at one point so it should come as no surprise when you see small site owners and web designers doing the same. So if you dig the look or believe that eBay is onto something by making their site look a little more Pinterest-like, then you’ve got to check out this theme. What’s even better is that the theme is compatible with various types of stores such as those that sell furniture, electronics, clothing and more. The majority of the themes listed below use responsive web design which is something that I’m a big fan of, because it’s a great way to optimize your site for users on mobile devices. Others don’t utilize responsive web design, but instead offer matching mobile themes. 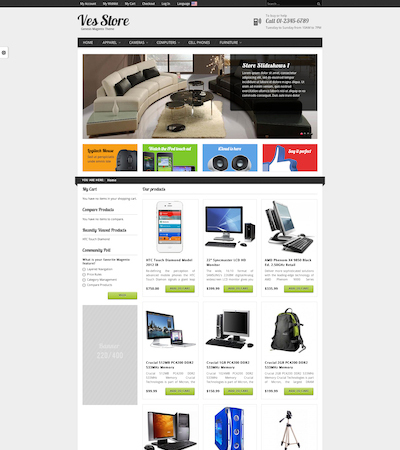 All themes have been categorized by the type of store. Below you will find themes for variety stores as well as for stores that focus on particular product lines such as clothing, jewelry, sports, video game and more further down. This theme lets us choose between black as well as 6 fluorescent colors: orange, purple, pink, blue, green and red. There are some really cool features such as the product quick view feature. To test this feature, simply click on one of the quick view buttons under one of the product listings on the home page and a light box with an overview of the item will pop up. This is pretty cool since it save buyers time by not requiring them to visit each and every product listing. As a result, this will likely get them to decide on what to purchase a lot faster. Other cool features such as product next and previous buttons on the product listing pages, quick currency selector, size chart, zoom to enlarge images, the ability to choose between a 3 or 4 column design for category pages and much, much more. I like this theme since it allows you choose how the content is displayed. For example, you can display your content on the left and your column on right or vice versa. Personally, I have always had a hard time deciding on which side I should display content and this makes it easy to switch back and forth. As for the look, I really like it since it gives you that modern square look that most ecommerce websites have switched over to. In the past it was all about rounded corners, but now this is in. Fair and square, right? 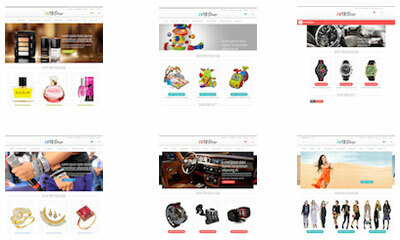 This particular theme is not only responsive but also lets you choose between numerous designs. For example, you can choose between designs for shops selling perfume; toys; watches; jewelry; automotive supplies, parts and accessories. 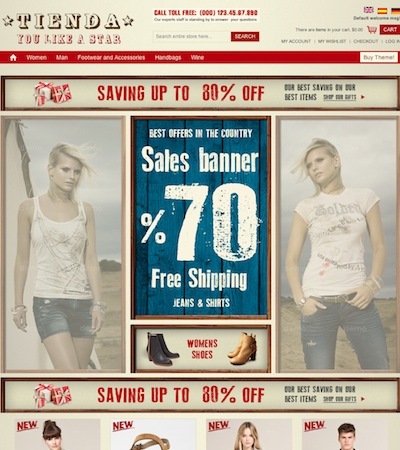 Additionally, the theme features extras such as ‘ajax add to cart’ which would allow your customers to add products to their cart without leaving the page that they are currently viewing, ‘product labels’ which show visitors which items are new and which are on sale, ‘ajax shop by price slider’ and more. This particular theme is one of my favorites and is likely a theme that I would use if I were running a boutique. The design is simply stunning and really has that small boutique in Italy look and feel to it. 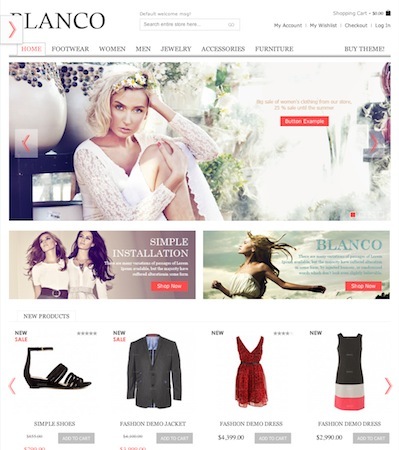 While the designer of the theme seems to be targeting merchants that selling various types of clothing, I feel this would also work well for sites that focus on a particular line of clothing such as a bridal shop. Additionally, the designers show examples of how customizable the theme is since it can be used with shops selling jewelry, handbags, furniture, toys and more. Tienda has a cool modern casual look to it so it definitely seems like it would fit sores selling jeans, tees and leather goods well. Included with the theme you will also find extras such as a drop down menu, slideshow, new products highlights on the homepage, social bookmarks and more. Electronic devices and computers are changing the way we look at movies, photos and the web in general. Everything these days is in high resolution and companies are constantly trying to outdo each other everyday by upping the standards. So it obvious that there is huge consumer demand. Well with this theme, you can now accommodate those devices with this theme which is Retina ready which will make your store really pop on iPads and iPhones. Do you sell lingerie? Well if you do, this theme can make your store look as professional as the one on the Victoria’s Secret website, but for a fraction of the cost I’m sure. 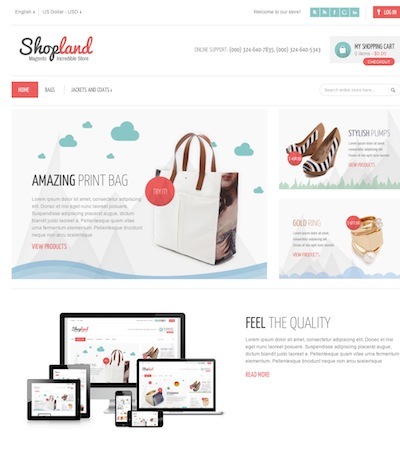 Of course adding a personal touch to your store is important and the designers of this theme realized that as well. Which is why they added the ability to choose between different layouts and colors such as blue, green, pink, black, orange and more. 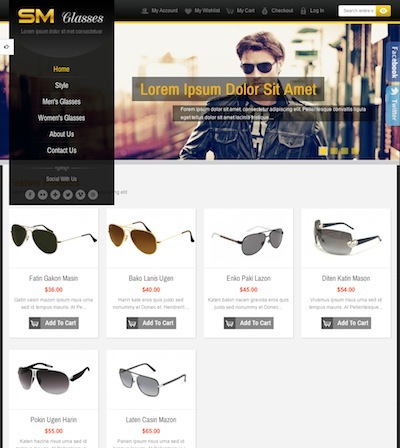 Here is an awesome theme that is just perfect for stores that sell sunglasses or eyeglasses. The theme utilizes CSS3 and features many customizable options which allow you to change the color of theme, menus and more. Additionally, the theme features social buttons, Google maps integration (which is great for merchants with physical stores) and more. 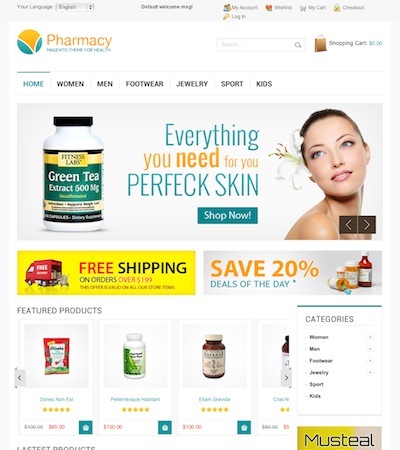 For those that operate online pharmacies or stores that sell herbal remedies, vitamins and/or supplements, the Pharmacy theme for Magento is just perfect because it offers tons of customizable options which allow you to change the themes layout, color, background menus and more. It also has added features such as a banner slideshow, new products display, social buttons, banners, a drop down shopping cart and more. 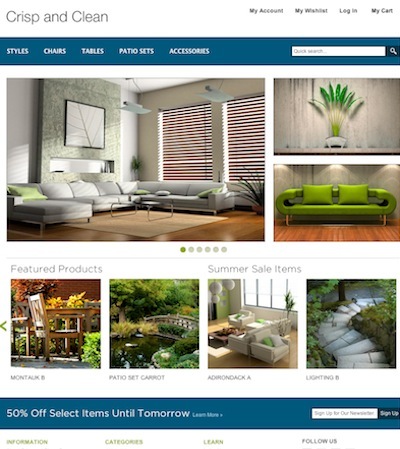 Here is theme that is just perfect for those that sell furniture, fittings, decorative accessories and more. 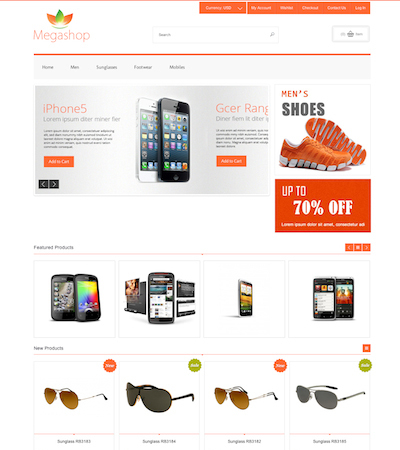 The theme (like its name suggests) features a clean and crisp design which makes stores easy on the eyes. Modern features such as a lightbox gallery, Amazon style multi-column sub navigation, cart preview modal window and more have been added as well. 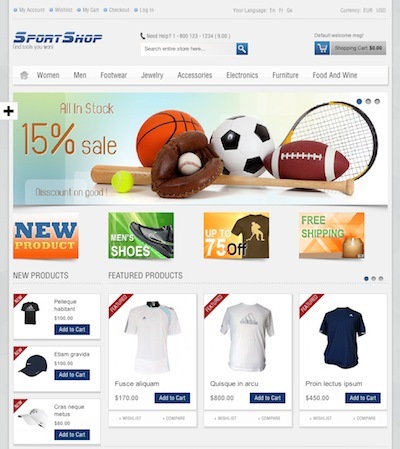 Here is a great theme for those that sell sports equipment, jerseys and other apparel, collectibles etc. The theme lets you choose between four colors: blue, red, green or orange, has different menus to choose from, banners and more. 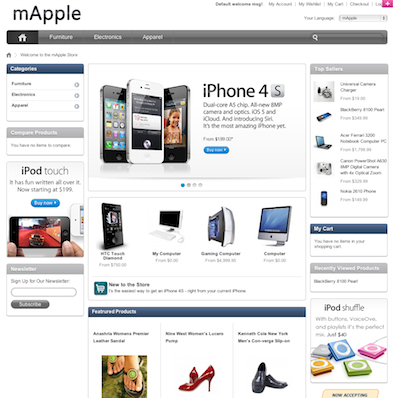 Additionally, the theme features a drop down shopping cart, social network buttons, lightbox image zoom and many other modern features. 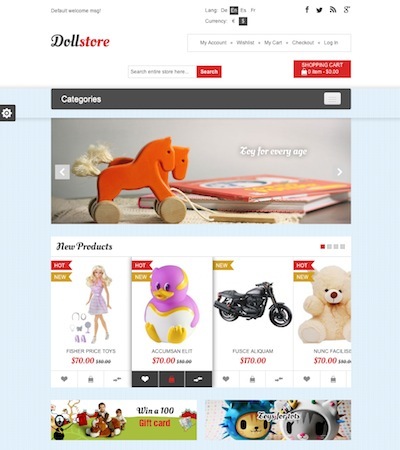 This toy store theme literally offers features that you can spend days playing with. For example, there are 4 colors to choose from: red, blue, orange and green, a mega menus which enables you to add custom images and descriptions along with your categories and subcategories, ajax paging which makes waiting for your web browser to load an entire pages a thing of the past, an upsell products slider and more. 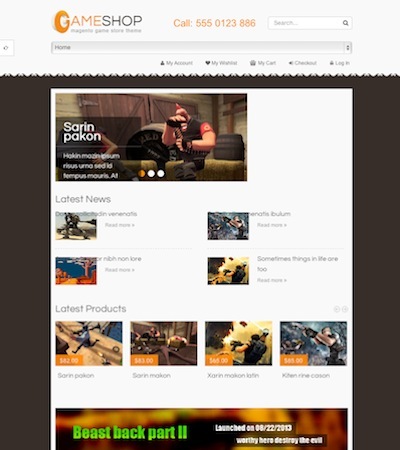 If you are looking for a theme that can make your Magento store look and feel like it was made for selling video games, this theme is the theme for you. With 4 colors to choose from: orange, green, burgundy and blue as well as mega menus, social buttons, different views for listing pages and more, your video game store will be ready for business in no time.